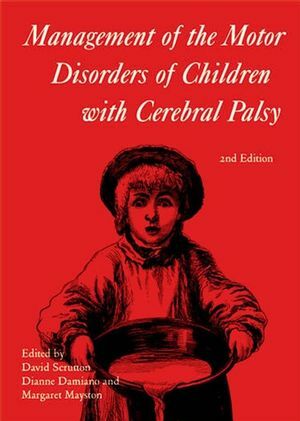 Since the first edition of this book was published in 1984 the intensive debates about the 'correct' method of treatment for children with cerebral palsy have been resolved and it is now possible to describe what is generally agreed to be the optimal approach. This entirely rewritten new edition describes the most up-to-date thinking, with two new editors from America and Australia reflecting the worldwide picture. Coverage includes the coordination of care and the management team; the types of cerebral palsy; assessment; goal-setting; learning and neural plasticity; global therapeutic approaches as well as more focused (topical) therapies; the mechanisms of deformity, its prevention and treatment; and the transition to adult life. This book details the advancement of the subject from 1984 to 2002. David Scrutton and Diane Damiano are the authors of Management of the Motor Disorders of Children with Cerebral Palsy, 2nd Edition, published by Wiley. Foreword Martin Bax and David Scrutton; 1. The family's needs: coordination of care and the management team Peter Rosenbaum; 2. The types of cerebral palsy; 3. Multidisciplinary Roslyn Boyd; 4. Goal setting and outcome measures Eva Bower; 5. Global therapeutic approaches and the evolving role of physical therapy Margaret Mayston; 6. Learning and neural plasticity Mary Galea; 7. Focussed therapeutic approaches Diane Damiano; 8. Mechanisms of deformity H. K. Graham; 9. Prevention of deformity Aidan Cosgrove; 10. Treatment and management of hypertonia Jean-Pierre Lin; 11. Transition to adulthood Sue Edwards; 12. Prospects for the future Murray Goldstein; Index. Coverage includes the: coordination of care and the management team; the types of cerebral palsy; assessment; goal-setting; learning and neural plasticity; global therapeutic approaches as well as more focused (topical) therapies; the mechanisms of deformity, its prevention and treatment; and the transition to adult life.